Our vast experience is envied by our competitors worldwide. We are unquestionably the global leaders in our field. Peden Bloodstock specialise in first class horse travel; and the provision of the associated equine health and logistics solutions required for intercontinental movements of elite competition horses. We are recognised by our clients as providing a 6* service for all our equine passengers whether they are a Shetland pony relocating across the world or an elite Show Jumper travelling to the Olympics. The role of Peden Bloodstock in each case has not been limited to flying the horses and their equipment - but we have additionally been responsible for all related logistical, regulatory and health solutions to facilitate smooth travel of horses as well as their grooms, equipment, feed and medicines to and from the events. In many cases our planning and preparation begins years before the Competition. Our remit often includes both venue & quarantine management where we are responsible for the provision of advice, as well as the implementation of, all aspects of stable management, stable biosecurity and related venue logistics. Peden Bloodstock have extensive experience in the establishment and operation of quarantine facilities throughout the world and our quarantine establishment and operation services are regularly called upon by government and event organisers worldwide to facilitate the travel of horses to and from international competition. Peden have been the Official Appointed Agent for all Olympic Games and the majority of World and Regional Championships for over 4 decades. This means Peden has been appointed under contract to facilitate the transportation of all horses to and from these events. Peden have been involved in the Olympic Games for over 4 decades; and with the Paralympic Games since their inception. Peden have been involved World Equestrian Games since their inauguration in 1990. Peden Bloodstock have been involved in the endurance sport since its international inception having flown some 170 horses from 42 countries to the 1998 World Endurance Championship in the UAE, a similar number in 2003 and all horses to the World Endurance Championships in Bahrain 2005 and Terengganu, Malaysia in 2008. Peden Bloodstock shipped the European Union & North American origin horses to Busan Asian Games in 2002 and Doha Asian Games in 2006. In 2010 the Asian Games were held in Guangzhou, China. This was the first time international equestrian competition has been held in China and Peden was responsible for co-ordinating the negotiation of health certification for each attending nation to travel to and return from the Games. Competition horses had never before been re-exported from China. This was therefore a major milestone for the equestrian competition world - and one to which Peden has undoubtedly made significant contributions. Peden Bloodstock also coordinated all arrangements for the 2007 World Cup Finals in Kuala Lumpur, the Rolex FEI World Cup™ Jumping and Dressage Finals in Las Vegas 2009 and were the Official Agent of the FEI World Cup™ Jumping and Dressage Finals in Leipzig, Germany 2011. Peden Bloodstock were the Official Shipping Agent for the Global Champions Tour Final in Brazil in August 2010. The majority of horses competing were of European Origin. Peden Bloodstock worked intensely with the European Commission to facilitate movement of these horses to and from Brazil to ensure the success of this major Show Jumping event. Peden have always been the Official Agent for the Athina Onassis Show in Rio and continue this in 2012. Peden Bloodstock continues to work with the GCT having shipped horses to their events in Doha and Abu Dhabi. 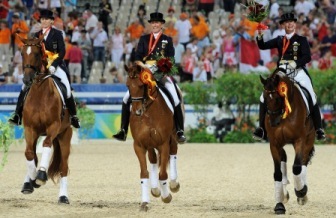 In 2010 the first international equestrian competition was held in mainland China. This was the first time horses have been re-exported from China to their country of origin. Peden Bloodstock worked closely with Chinese government officials, airport stakeholders and vets in the EU, China and across the hub countries throughout Asia to facilitate the establishment and use of an equine disease free zone in Conghua, China for the period of the Asian Games in 2010. Peden were responsible for leading the negotiation to establish successful certification for horses travelling to and returning from the Games. Peden Bloodstock are now successfully shipping horses to China as equestrian sport rapidly develops in Asia.